Sweet-Pea and her last meal. This Labor Day was one of the most exhausting ones that I can remember. I ran the gambit from laughing, crying mourning, and laughing again. I’ve helped a dog rescue group for the past few months. It’s the group that we got our Katie from. When we got Katie, all I wanted was a dog. One dog. It turns out I found a whole lot more. For the most part, I just go along for the ride to the reservations and look pretty. Sheri drives and I prattle on about nothing and everything. She tells me where we are going and what we are going to be doing. I might hold a dog or take a picture. She does the bulk of the work. Today was going to be a long day. I had no clue how long. We logged in over 200 miles rescuing dogs. Dog Rescue was all puppies and happy adoption tales until today. Today was not the usual Puppies and Unicorns farting rainbows kind of rescue day. Oh, no. It was to be much more than that. One of our stops was to pick up an older dog. We were told that this old dog needed to be put down. Both Sheri and I fretted about this. Neither of us want to put down a dog just because she is old. We were talking about different options. Just because a dog is old, doesn’t mean that it doesn’t deserve a home. So many people look for and desire the cute puppies. They forget that older dogs have love to give as well. When we arrived at the house to pick the dog up. The woman who found the dog helped us to drag her out from under the porch. It turns out that one of her back legs was broken. I thought that it could be fixed. Her fur was badly matted. The woman who found her told us that she had cut off about a pound of mats off of the dog. Oh well, mats can be cut off and hair will regrow. When Sheri lifted the dog up to carry her to the kennel, we both gasped. The poor old dog had a huge gaping wound on her stomach! It was as if she had an abscess or something and it had opened up. This huge mass was open and raw on her stomach. I would say it was larger than a grapefruit. (I won’t be posting pictures of the wound) She was so tired and lethargic, which was so understandable. She didn’t whimper or cry. She was silent. The stench coming from the gangrenous wound was horrendous. We both knew that there was no way she could be saved. The kindest thing would be to put her out of her misery. We had a couple stops to make before we could get her to the vets office. Out of the blue I just started crying for her. My heart hurt so much. How could someone see this huge wound and do NOTHING! I asked Sheri if we could put her on a blanket outside the vets so I could just love her, pet her, and talk to her. Sheri agreed and told me that we would be buying her some hot dogs. A last meal of sorts. I stopped crying for a bit and we finished up our rounds of animal pick ups. The Vets office has a concrete courtyard area outside the kennel area. The old girl had not whimpered, whined or anything while she was in the vehicle. I ran to the courtyard and laid the blanket down for her. Sheri carried her and gently laid her on the blanket. Poor old girl didn’t make a peep. Once she was on the blanket I started to cry again. I stroked her head and told her what a good girl she was. She looked up at me with her soft brown eyes, not fearful, not angry, but trusting and calm. I started to call her Sweet-Pea. She deserved a name. Everyone deserves a name. I broke off pieces of hot-dog for her and she gently took them out of my hand. I kept stroking her and using my shoe to keep the flies off her wound. She was alert the whole time. I offered her water and she wouldn’t take it. Finally, I put some on my fingers, in hopes she would lick them and get some water. She didn’t. She smelled to high heaven, but I didn’t care. She was one big mat and I didn’t care. At one point she started to lick her wound and all I could do was turn away. I wondered if she ever had a home where she was loved. I wondered if she ever knew what it was like to be a part of a family. The warmth of a soft touch. Kind words. Did she ever get to know love? Then I thought about our Katie and Patch who also came from reservation and started to cry harder. If not for Sheri, then Katie or Patch could have been this dog when they got old. That was like a punch in the stomach. Finally, it was time to put her in the kennel. The Vet wouldn’t be seeing her until the morning. I folded her blanket so the blood was on the inside and laid it on the cold concrete floor. She had a pretty white blanket with flowers to cushion her old bones and her wound. I brought the remaining hot dog and laid it beside her. I also brought in water. I knew she wouldn’t drink it, but she should have it anyway. I sat down in the kennel and stroked her some more. It was hard to see her sweet eyes through my tears. She tried to adjust to find a comfortable position. I spoke softly to her some more. Telling her she was loved. Her life would be better when she came back as a puppy again. I kept calling her Sweet-Pea so she knew she had a name and someone knew it. She laid on her side and looked at me one more time. I patted her gently. With a very heavy heart it was time for us to go. Sweet-Pea had found a position that would work for her and she looked content. All I could do was close the door softly, say a small prayer, and walk away with sorrowful heart knowing that this was to be her last day. At least she knew she was loved, if only for a short while. the moment to chat using a potential partner has arrived. What a sad story. You did the right thing. It must have been so hard to live through all of that. Still I guess we all hope that situations like these didn’t exist. I will never understand people who discard their pets like unwanted objects. Our dog is a rescue dog too, and she is so sweet and grateful for having a home. I recommend adopting to anyone – and often the older dogs are the best. My heart is heavy with tears after reading this, Bernie. As I posted on Facebook, I had to put one of my cats down last week and I held him as he took his last breath. Have been there too much lately, with other members of our Fur Family. My middle daughter is an active rescuer as well as the Dog Warden for our town and some of what we have witnessed in the way of abuse and neglect is well…criminal. Now and then there are happy, tail-wagging, endings but not enough. I cannot commend you and Sheri enough, words are inadequate, my friend. Love and Blessings to you both! I am sure it was very hard for you to find and know there was nothing you could do for Sweet Pea except love her and let her know that. Thank you and Sheri for your hard work and for Nutmeg. We love her and enjoy haveing a fur baby in our house. Oh Bernie, here I am crying at your caring story of love and no kleenex. After living here since 1966 I know all about the rez stories and have lived some similar to yours but once you give love to a dying animal and let that animal know there are loving and kind people in this world it makes it worth the pain. Every day I say a prayer for women like you and Sheri!! I am sending HUGE HUGS to you both!!! You and Sheri are amazing…. I can’t even imagine how hard it was for you… When you are sad, and the bad memories come back, just think about how you helped that sweet girl finally find peace, and give her love. Her final time was spent being loved… can anyone ask for anything more? It is so heartbreaking what so many animals go through… I wish all of them could be so fortunate to be a beloved pet. 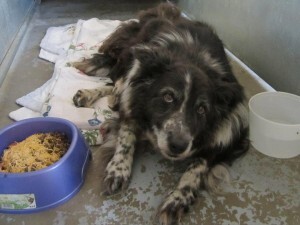 Sweet pea may have had a hard life, but in the end, with you, she was a pet…. I knew you would make me cry. As I sit here blubbering I am so thankful for people like you and Sheri and so many others who help with the rescue of dogs and others who can not fend for themselves in a sometimes cruel world. I don’t care what anyone says or thinks—we have a responsibility to care for all of God’s creatures—two legged, four legged or more!!! Thank YOU for sharing a story that was hard to read and harder to live through, I am sure. Hugs. And to Sweet -Pea—hope you are running and chasing butterflies and eating steak somewhere over the rainbow.